On January 30, two months before the deadline set by the UK under Article 50 two years ago, the European Parliament held a debate on Brexit. All categorically excluded the reopening of the Withdrawal Agreement reached between the 27 Member States and the one Member State that had decided to leave. The agreement had been reached after one year and nine months of negotiations. During this time the 27 were constantly informed of all developments and were assured that the internally negotiated mandate they had given to the European Commission and its negotiator was being kept to. Such a mandate is always difficult to achieve since each Member State needs to provide an assurance that its government has the backing of its parliament before a common agreement is reached. Shocked as they were, they got together to internally achieve a common position. The process of getting the mandate was a long, arduous and democratic process. Every ambassador in Brussels received instructions from his capital after, in most countries, scrutiny by parliament following consultations with industry, trade unions, experts, journalists and NGOs. A good example is Denmark, which practises the most open, transparent and modern democracy. Its government can only act upon the position and the limits to government set by a parliamentary decision in advance. Since Denmark practises proportional representation in parliament where all votes are relevant, the government is often made up of coalitions covering a wide spectrum of society most often representing between 50 to 60 per cent of the electorate. In the UK, the Member State that had decided to break away from the greatest post-war peace and economic growth project the world has ever seen, the negotiating position, including the so-called red lines, were set by the Conservative Party alone. The government, perhaps even the Prime Minister and her inner cabinet alone, set out the first lines of negotiation. The party in power had obtained 13.6 million votes in the 2018 election: 42 per cent of the 32 million votes cast, 29 per cent of the 47 million-strong electorate and only 22 per cent of the total population of 62 million. This is hardly a majority of the country. Even if one adds to this the 292,000 votes of the Irish DUP, the coalition of Tory/DUP constitutes just 43 per cent of votes cast. Yet these two parties together command 50.5 per cent of the votes in the British parliament. The absurdity of the British system is so obvious that, had they not taken themselves so seriously for so many hundreds of years with this undemocratic method of electing their government, the British would have changed their system ages ago. Thank God that we in Malta did not get bequeathed with the absurd British system when we broke away from their occupation in 1964. So on Brexit, we have had on one side the British negotiators negotiating without a detailed mandate from their parliament, changing negotiators four times, with the party leading these negotiations representing 29 per cent of the electorate. It was very shocking and surprising to the European Parliament, to the presidents of the Council and of the Commission, to be told by the UK that unfortunately the agreement signed by the UK government had not received the approval of the national parliament in London. Speakers in the European Parliament lambasted the lack of democracy in the UK. This is not the way things are done in Brussels nor is it the way the UK has consistently worked in the past. They usually had tacit approval from home before signing up to EU decisions. And now, on a decision with the most serious implications for the 62 million UK citizens, it seems that the Prime Minister – representing only 29 per cent of the electorate – now wants to reopen the negotiations she led and cancel the agreement she signed because she did not obtain the approval of her parliament. Europeans are astonished that this is the way things are done in the country which claims to be the oldest democracy. Sorry, it is farcical and does not deserve to be taken seriously. What the UK has been trying to play is an old negotiating trick applied by gangsters who use threats and run down the clock when they are incapable of achieving their objectives by negotiation. What are the objectives of the UK? It has always been apparent from the very beginning, in 1973 when the UK joined the EU, that they did not want to share the political objectives of the Common Market, the EEC and later the EU. They only wanted to enjoy the economic benefits in a loose single market. The Treaty, from the very beginning in 1958, was clear that the EU would work towards ever deeper economic and political union. This was long before the UK decided to join and long before General De Gaulle, who with foresight had predicted the damage that the UK would cause within the EU, relented and allowed them to apply. Since joining, the UK has constantly tried to thwart all moves towards political and economic unification. Finally, the UK decided to leave. Europe breathed a sigh of relief. Although Europe will miss the size of the UK market, its financial services know-how, its pragmatic approach to many issues not connected to political or economic union, such as the environment, foreign affairs, social affairs, science and technology, and research, it will be far better to move forward with 27. There is a risk that the UK will have to leave the EU by crashing out without an agreement, without a transition period and without a hope of ever having a sympathetic ear in any of the 27 remaining Member States. Yes, some right-wing nationalist and fascist parties around Europe, making up around 16-20 per cent of the votes cast in the last elections of the 27 Member States, may agree with the UK. Sixteen per cent of the votes cast in Europe constitute eight per cent of the electorate and five per cent of the total population. The 92-95 per cent of the European population of the remaining Member States do not always agree on all issues of the EU but they do stand fast against fascism and for the protection of the four freedoms of People, Capital, Goods and Services against countries that want only the cherries but not the downsides of the freedoms. Sorry UK, take it or leave it. Mrs May does not aim to drop any red lines, does not accept to remain in the customs union and to protect social, labour and environmental rights. She does not accept the opinion of all opposition parties combined, representing 18.3 million votes or nearly 57 per cent of votes cast, to delay and extend the March 29 precipice date. She is led by the nose by a very strong but small virulent group of Englanders in her party who hate Europe and want to cut all ties, and are hoping to crash out on March 29. They only represent 3.4 million voters or 10 per cent of the electorate. Now, when the national interest is at stake, she should look to a much wider coalition of interests to take the high road and to spare the population lots of pain and suffering and risk breaking the Tory Party up in two. She should find a softer way to exit Europe, doing a Norway, a Switzerland or a Canada arrangement which would suit industry, workers, environmentalists and socialists alike. 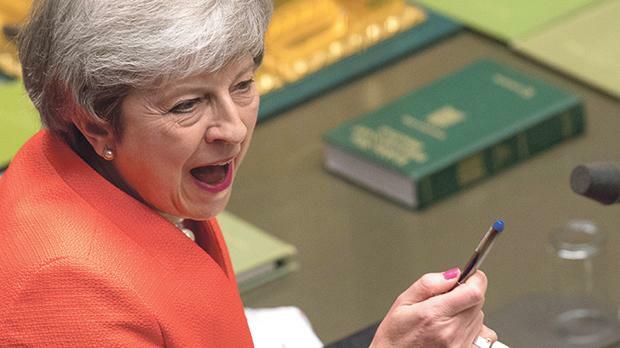 She could get a resounding mandate from her parliament, which would represent over 87 per cent of the electorate or 61 per cent of the registered voters or 45 per cent of the total population, and grant to those who voted to leave in the referendum a regulated departure from the EU. The EU would accept such changes to the withdrawal, bringing about a greater coordination of the two markets for many years to come. Calling a new referendum or an election is the other option which would delay the March 29 departure and could even cancel Brexit altogether. That is improbable and much worse for Europe in general, since for such a divided country, with no real European ambitions, to remain in the EU it would only weaken the European spirit further. Mutual trust has been lost and it will take a generation to rebuild it. Who knows whether the break-up of the United Kingdom will take place during that time and some parts like Scotland and Ireland will join the EU on their own steam in the next 20 years? This clearly shows that Mrs May’s loyalty is towards her Tory party and not towards the majority in her country and certainly not towards Europe. But we knew all that before today and still the English have the audacity to call themselves the oldest democracy.